Queen Steam Fishing Co Ltd.
Regent Petroleum Tankship Co. Ltd.
Rivers Steam Navigation Co. Ltd.
J.R. Rix & Sons, Ltd.
From the website of the National Maritime Museum, the house flag of the Queen Steam Fishing Co Ltd., Grimsby. A white flag with a blue saltire and a red letter 'Q' in the centre. The flag is made of a wool and synthetic fibre bunting. It has a linen hoist and is machine sewn. Brown (1951) shows exactly the same flag as the Queen Steam Fishing Co. flag (but proportioned 2:3) for the Queenship Navigation Ltd., London. RACAL Energy Resources Ltd., London - yellow flag, red rounded rectangle, white "RACAL". The company started off in the late1950s in electronics, manufacturing communications equipment based on a method for generating High Frequencies for long range communication invented by a South African electronics engineer. Their customers were mainly the navies of the West. The advent of satellite communications probably forced them to diversify. Lloyds Book of House Flags and Funnels (1912) shows the house flag of "M.A. Ray & Sons" (#306, p. 51), a company based in London, as white with the red letters "M.", "A. ", "R." and "S." in the respective corners and "&" in the middle. From the website of the National Maritime Museum, the house flag of R. & J. H. Rea, Liverpool. A red flag with a white-bordered black diamond in the centre bearing a white 'R'. The flag is made of a wool and synthetic fibre bunting. It has a cotton hoist and is machine sewn. The design is printed. Lloyds (1912) shows the house flag of G.T. Redhead & Co., Newcastle-on-Tyne, as blue with a white diamond charged with a red R. Also displayed at http://library.mysticseaport.org/initiative/ImPage.cfm?PageNum=30&BibId=11061&ChapterId=8 . Quartered per saltire in white, green, red and blue. The Southampton Isle of Wight and South of England Royal Mail Steam Packet Public Limited Company. Universally known as Red Funnel for short. The Southampton and Isle of Wight RMSP Co Ltd used a diagonally divided flag that was - clockwise from the top - white, green, red and blue. The funnel livery has changed through time, see here: http://www.redfunnel.co.uk/redfunnel. This page of the same website gives the origin of the flag colours: "The Company's famous house flag was derived from the names of four steamers that were in the newly merged fleet in 1861- Sapphire, Emerald, Ruby and Pearl. Blue to mast, green to fly, red on deck, white on high." Postcard #11, 1st flag of the collection reads " reads "Red Funnel Steamers Ltd. (Southampton, Isle of Wight & Royal Mail Steam Packet Public Co. Ltd.)" (i.e., not the exactly same name). Red 'R' Steamship Co. Ltd.
From the website of the National Maritime Museum, the house flag of Red 'R' Steamship Co. Ltd. A white rectangular flag with a red 'R' in the centre. The flag is made of a wool and synthetic fibre bunting. It has a cotton hoist and is machine sewn." Red "R" Steamship Co. Ltd. - Jarig is correct with his matching with Stephens, Sutton Ltd. as the latter was the parent company and this is a case of the flag producing the company rather than vice versa. The origins go back to Daniel Stephens who left the sea in 1871 and the following year founded Stephens & Kendrick in Newcastle. In 1873 this became Stephens, Kendrick & Mawson who acquired their first steamship in 1874. In 1878 it became Stephens & Mawson with a separate company of Stephens, Mawson & Goss being started in Newport. Two flags are given for Stephens & Mawson by Lloyds 1882 with the first also being given under the name of the Red Cross Line, being white with a red saltire. This is also shown, without the alternative name, by Griffin 1893 and 1895 and Reed 1891. The second flag was white with a red "R" i.e. as shown by Jarig and predating the formation of the Red "R" Steamship Co. Ltd. which was formed as a subsidiary but not until 1887. The "R" possibly comes from the practice of the ships names beginning with that letter. The first allocation found of the flag to the subsidiary is by Reed 1901 which does not mention the parent company. The subsidiary lasted until 1917 when it went into voluntary liquidation but in 1929 the name was re-activated but it is not clear whether the company was likewise brought back to life. Whichever applies, it does not appear to have survived WW2. The parent company in the meantime changed name in 1901 to Stephens, Sutton & Stephens and the white flag with red "R" is shown under this name by Lloyds 1912 and Reed 1912, both as well giving the Red "R" name and the latter indeed giving them both an entry. Then in 1919 the parent company changed again to Stephens, Sutton Ltd. which went into liquidation in 1967. The flag of white with a red "R" is shown under this name by all the main sources subsequent to this date though Brown 1926 shows a yellow flag instead of white which is presumably a printing error. There were other flags involved. The firm of Stephens, Mawson & Goss is shown as having a white flag with a red diamond bearing a white "C" by Griffin 1895 and Reed 1901. Why a "C" is not clear but as "R" seems to have come from ship names perhaps "C" comes from 2 [out of 3] ships given for the company which started with this letter. The company acquired its first steamer in 1880 but was wound up in 1895 and reformed as Stephens, Mawson & Co. In 1901 Arthur Mawson took over the company and moved to Cardiff where he traded under his own name until retiring in 1915 when his fleet was sold. Two flags have been shown. Lloyds 1912 shows a blue flag with a white border, except at the hoist, and bearing a white "M" whilst Reed 1912 shows it as white with a very broad horizontal blue band bearing a white "M" both as Arthur Mawson & Co. and as the Mawson Shipping Co.
And Daniel Stephens of Newcastle, presumed to be the man himself, appears in Reed 1901 with a white flag bearing a red star and crescent with a version being given in Lloyds 1904 for Stephens, Sutton & Stephens. This flag is mentioned by Talbot-Booth in his "Merchant Ships" 1942 and 1944 books under the Red "R" Steamship Co. Ltd. as having been used by tank steamers previously owned by that subsidiary. Elsewhere we learn that this company was established at Liverpool � just enter �bocna� under �Name� and click �SEARCH� (later click �VIEW�): http://www.hartlepoolbuilt.co.uk/form.html. I suppose Red Rose Navigation (�Bocna� was first named �Rose of Lancaster� � also look at the funnel) moved to Bermuda for fiscal reasons. Certainly active 1958-1965 but no other ship found yet. The house flag appears to have been square: dark blue field, large white disk bearing a red rose seeded and barbed green. From the website of the National Maritime Museum, the house flag of the Regent Petroleum Tankship Co. Ltd., London. A white flag, in the centre with a disc divided into red over blue and a blue-edged white border. The name 'REGENT' is in blue letters on a white background across the centre. The flag is made of a wool and synthetic fibre bunting. It has a cotton hoist and is machine sewn. The design is printed. A rope and two Inglefield clips is attached. The company ships were absorbed into the Texaco fleet by 1968 and their own livery was abandoned." Brown's Flags and Funnels (1951) lists for Regents Line (Grand Union (Shipping) Ltd.), London, a yellow flag with over all a blue Y; in top a white disk with three blue horizontal stripes; at the hoist a black capital R; at the fly a black capital L.
Rhondda Merthyr Steamship Company, Cardiff - white flag, red cross, in the center red disk; "RMSC" in blue in all quarters. The tenth photo on this page, showing details of plates and other things recovered from shipwrecks (and showing a flag): http://www.users.globalnet.co.uk/~indigo/flags.htm. The house flag�s colours are not shown. The firm�s initials are put in the corners (R, M, &, C with raised 'o' arranged in the usual fashion) and in the centre are the Prince of Wales�s feathers and coronet. I haven�t been able to find out much about this firm, other than that they were managing the Dominion Line of Liverpool (in other places called �Mississippi & Dominion Line�), the British & North Atlantic Steam Navigation Co. Ltd. and the Welsh Castle Line. Traces found date from the 1890�ies. On this page (Aberystwyth Castle, first ship�s file) it is said that the firm had a "reputation for closeness�. I like more the sound of �Welsh Castle Line� which at least has the merit of suggesting the feathers and coronet. But that too, proved a dead end. Found the house flag illustrated on the Liverpool Journal of Commerce chart for 1885. It is white, the letters are black, and the Prince of Wales's feathers (depicted on the chart as an ornate fleur-de-lis) are red. Griffin�s �Flags national and mercantile� (1891), no. 161 (plate 12, steam vessels). As a matter of interest, the same flag � smaller feathers, however: different drawing � is shown in Griffin as no. 625 (plate 23, sailing vessels) representing the same firm. Lloyds Book of House Flags and Funnels (1912) shows the house flag of "J.N.O. Ridley, Son & Tully" (#166, p. 44), a company based in Newcastle-on-Tyne, as horizontally divided white-black-white. SS "Newton Beech", built in 1925 in Sunderland, operated the Tyneside Line for "John Ridley, Son & Tully" when she unfortunately met the German "Admiral Graf Spee" on 5 October 1939, south-east of Ascension Island. On 7 October, SS "Ashlea" was captured and the crew placed on the "Newton Beech". After the combined crews were again transferred to the "Graf Spee", "Newton Beech" was sunk by "Graf Spee" on 8 October off the coast of Angola. River Bulk Shipping Ltd. is a British firm established at Rochester (Kent) on the River Medway, operating two small self load & discharging vessels able to transport all kinds of commodities including projects or special loads. RiverBulk (Truro) Ltd is a subsidiary engaged in warehousing whereas Coastal Bulk Shipping � same address � is an associated company. In addition to that, a specialized barge is mentioned �suitable for the storage of up to 1400 tonnes of water sensitive and other high grade cargoes�. The photo gallery offers clickable pictures often showing the attractive livery of a yellow star � on vessels� bows and cranes � on a green background. The house flag proper appears as a drawing and is also visible in the cloth, on the starting page. Horizontally divided green-white-green, a yellow five-pointed star in the centre of the white stripe (no high visibility I am afraid): see attachments. From the website of the National Maritime Museum, the house flag of Rivers Steam Navigation Co. Ltd., London. A white, swallow-tailed burgee with a blue saltire. A red disc is placed in the centre. The flag is made of a wool and synthetic fibre bunting. It has a cotton hoist and is machine sewn." It is similar to the flag of the Anglo Saxon Petroleum Co., London, with white field, blue saltire with red disk, according to Loughran (1979). 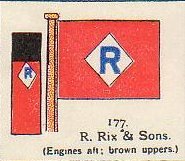 J.R. Rix & Sons, Ltd., Hull - blue flag, red diamond, intertwined white "JR". RMC Group, p.l.c., Feltham - orange flag, black outlined diamond, black "RMC".